The demand for health care services continues to grow, opening up many opportunities for Certified Nursing Assistants. The education and training you receive at Northwest NAC Training will prepare you for jobs in long-term care facilities, hospices, clinics, and hospitals. If you are looking for a faster pace, hospital patients are usually discharged after a few days. If developing a relationship with patients is more to your liking, long-term care could be the answer. In either setting, as a Certified Nursing Assistant, you’ll be working in many different area of the healthcare field. More than helping patients with bathing, dressing, and eating, a Certified Nursing Assistant can also be responsible for gathering information about conditions and treatment plans for patients, taking patient vital signs, and even addressing wounds patients may have. At times, the relationship between a Certified Nursing Assistant and patients can be quite personal, and the job can be stressful, difficult, and very unglamorous. 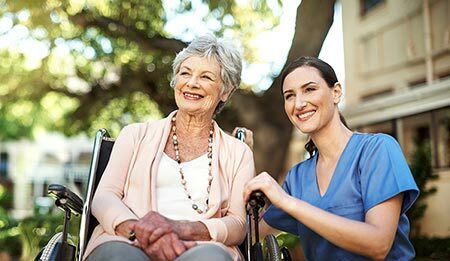 However, if you have a desire to help people at their most vulnerable and to make sure they are treated fairly, safely, and with compassion, a Certified Nursing Assistant career could be right for you. Having a positive attitude and treating patients with respect are important aspects of the job. Many times, a CNA is the main patient caregiver and acts as a conduit between the patient and their nurses and doctor, making good communication skills a must. The ability to handle patient calls, patient family concerns, and being familiar with medical charting software are all desirable. Being a Certified Nursing Assistant can be a demanding job and often involves working nights, weekends, and holidays. However, if helping others with compassion and respect when they can’t help themselves is meaningful for you, it can also be a very rewarding and fulfilling career. Click here to fill out an application and become a CNA in 30 days. Students who receive their nursing assistant certification from Northwest NAC Training have found CNA careers and employment at several local businesses. There are many opportunities for nursing assistants in the Vancouver area, including home care, senior living, and other health fields. Yes! If you plan on working in Oregon, all certifications will allow you to seek a CNA career within Oregon after paying only a $60 processing fee, subject to approval. Visit Certified CNA Training Portland. Find Tips to interview for a CNA position.